Perhaps to the surprise of many, the iconic images of the fascinating and mischievously comical lives of young boys and girls imagined by Norman Rockwell during the early 1900s, were neither a wholly American invention, nor were they the first to treat the subject of children in such a humorous and anecdotal manner. Prefiguring the immensely popular imagery of Rockwell, Paul-Charles Chocarne-Moreau introduced the French public to the secret scenes of young boys at play, recalling for his audiences the playful deceptiveness that characterized the age of youth. Interest in children and their development had been increasing throughout the nineteenth century and Chocarne-Moreau harnessed this interest to create images that both capitalized upon and popularized this preoccupation. Chocarne-Moreau was born in Dijon, in the Burgundy region of France, in 1855. His exact birth date has not yet been discovered. He undertook his most important artistic training in Paris, initially in the atelier of the academy teacher, Tony Robert-Fleury, before undertaking further instruction under William Bouguereau. Both were teachers who had reputable careers; they eventually became presidents of the Société des Artistes Français, Robert-Fleury following Bouguereau. 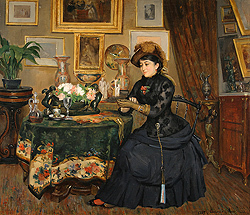 Chocarne-Moreau was under Robert-Fleury’s tutelage when he debuted at the Salon of 1882 with a painting entitled Distractions (Distractions). He did not exhibit at the Salon of 1883, but returned in 1884 and was listed as a student of both Robert-Fleury and Bouguereau, exhibiting La Part du Braconnier (The Poacher’s Share) at the Salon. At the 1886 Salon he exhibited Avant le Salon (Before the Salon), for which he was given an Honorable Mention. The child, ignored during the Middle Ages and the beginning of modern time – longer even within the popularized classes – confused with adults (they were a reduced adult), misunderstood in their specificity and their humanity, emerged in the collective sensibility in the XVII an XVIII centuries. It was then that the bourgeoisie and the aristocracy became aware that childhood is an age in life which has its own characteristics, an all particular sensibility and intelligence. It is just this particular character of childhood that Chocarne-Moreau seeks to represent, but not the childhood of the upper class of society, but children of the working class, and young boys to be more specific. 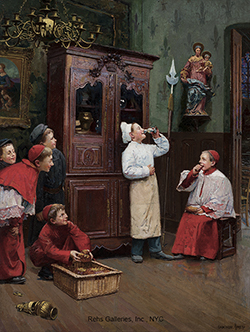 He especially favored scenes of young boys’ activity within the church, showing the liveliness behind the solemnity, such as his work, Le Jeu de la Grenouille (The Frog Game) or La Répétition Générale (The Dress Rehearsal) of 1925, both images depicting what young boys truly do when their masters are not watching. Another favorite scene for Chocarne-Moreau is that of the young baker, most often doing anything but baking, or a combination of the two types such as found in Le Petit Journal (The Petit Journal). In each example, the goal is similar: to represent the dichotomy of the young boys action in relation to their situation. Such a seemingly intentional dichotomy is exactly that which creates the strongly humorous aspect that characterizes paintings by Chocarne-Moreau. …genre painters searched for new ways to enter the consciousness of the broadest possible public audience. Since genre painting involved the depiction of episodes from daily life, either contemporary or historical, these paintings were regarded as a source of popular entertainment and education. In essence, what made genre painting so popular was that it involved the public intimately: a viewer could find personal references in any number of the stories and characters visualized. Genre painting appealed to a viewer’s feelings…In an age given to the proliferation of newspapers and popular magazines, genre paintings filled with human interest narratives provided concrete visualizations of many of the stores of episodes offered in newspapers and popular novels. While these scenes of children are those for which he is best known to present collectors, it is clear from his Salon entries that he was also interested in portrait and landscape painting. By 1888, Chocarne-Moreau had become a member of the Société des Artistes Français and the following year, took part in the Exposition Universelle where he was awarded a bronze medal. He continued to submit regularly to the annual Salon throughout his career. He died on May 5th, 1931 in Neuilly-sur-Seine, just outside of Paris. Chocarne-Moreau sentimentalized images of the childish play of young boys while contributing to the expansion of the boundaries of genre painting. These amusing and often silly anecdotes were a pleasing respite from an often serious period in the history of art and were refreshing in their desire to depict an average day in the life of a young boy and his compatriots. While both the narrative scene and the genre tradition were being challenged, Chocarne-Moreau’s images show that there were still both artists and patrons interested in images with which they could identify. The sheer number of works by Chocarne-Moreau that populate the market, suggest that during his career, there was a large audience interested in purchasing them, and a continuing audience base into the twenty-first century.